I have a gear ratio question for some of the more experienced mini z folks. I always change gear ratios with the pinion and never touch my spur. Are there advantages to changing ratios with a spur instead? You can get a more subtle adjustment by changing the spur. Changing the spur in combination with the pinion can also change the location of the motor in the mount. Some mounts have restriction in motor positions, where you may not be able to fit a certain pinion without changing the spur for more clearance. Smaller spurs have less mass, bigger spurs have better gear contact. Smaller spurs also allow a smaller rear tire diameter, or a little more clearance that can be useful on carpet. In the end, the most important is usually dialing the exact ratio. You can see the subtle changes that the spur change makes compared to the pinion. Thank you EMU, I knew there was a reason for it. My program is not that refined yet, but I've been trying out the Nissan R390 GT1 body on a 102 mm car and I am getting some spur gear rub on the rear of the body when I turn. I ordered a smaller spur with hopes it will give me the clearance I need. (52t was the smallest PN spur I could find) I started wondering what is the real reason I should be trying different spurs? PN part #MR2951 is their 51t spur. The sauber LM body also has some clearance issues around the spur. I totally forgot about that with the reasons one might have to change the spur. 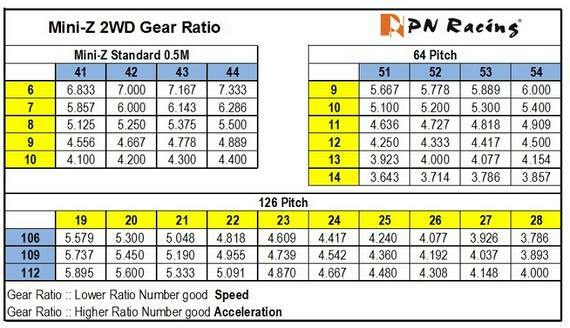 Hopefully not saying something you already know, but remember to not mix stock gear pitch with 64 pitch. That 52t you ordered is 64 pitch, so you need 64 pitch pinions. Yes, thanks! I have 64 pitch gearing. One car with PN gear diff and a couple with pn ball diffs. I like trying different things, hence the Nissan and the 102mm setup. I seem to be slowly acquiring a fleet. Our group is small and laid back so I just qualify 2 different cars, lend a friend the third and drive the fastest in our HFAY main.